African American Brides Blog: Is Assigned Seating Really Necessary? Should you assign seats at your wedding reception? Or let guests fend for themselves? It all depends on who you ask. But the prevailing opinion is this: Assign places, but don't micromanage. It's perfectly OK to assign only tables and allow the guests to choose their chairs. Martha Stewart says only the most formal receptions require place cards at each setting. 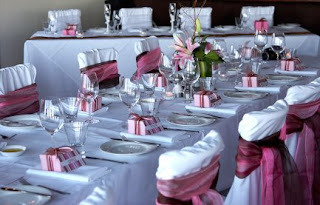 But, if guests are left to choose their chairs from a whole room of tables, they'll take longer to seat themselves- or may not seat themselves at all until the last minute. You could also be forced to pay for more settings than number of guests because of incomplete tables. So give it some thought, and take into account guests interests and personalities when you're deciding who will sit where. It will be well worth the effort. I like the idea of assigned seating, but not telling people where they have to sit at the table. I think most guests like to know where they are sitting and not have to roam around the reception hall trying to find a free seat.